This technology results in recovering more of the contaminant and recovers the contaminant faster than previously possible compared to standard remediation technologies. This is accomplished by energy breaking the bond between the hydrocarbon contaminant and the water and soil. The hydrocarbon can then be recovered using traditional liquid pump and treat, or soil vapor extraction (SVE), depending on the nature of the hydrocarbon. Energy waves are generated in a trailer-mounted unit on the surface. These energy waves are transmitted via a rectangular aluminum conduit called wave-guide. The 915 MHz waves travel through the wave-guide and are emitted from a subsurface antenna suspended in a well bore. The energy speeds up chemical reactions. This causes light end hydrocarbons to volatilize faster. (faster recovery of vapors) And will cause heavier end hydrocarbons to break the emulsion with water. Both results achieve a faster and more complete recovery of the contaminant. The case studies were performed at the Ashland Refinery in Saint Paul, Minnesota. This system captures and recovers volatile organic compounds (VOC’s). The process uses granular activated carbon (GAC) to remove the VOC’s from the air stream. It continuously regenerates the used GAC with microwaves, and recovers the VOC’s, desorbed from the GAC, by condensation. The process has been proven at McClellan Air Force Base in 2003 to present. The alternative is catalytic oxidation, which requires large volumes of natural gas to oxidize VOC’s in SVE vapors (600 - 800o C). This oxidation produces dioxin as a by-product. Dioxin is a known carcinogen. Permits are no longer granted in California to use catalytic oxidation. GAC adsorption beds are used to capture solvent or gasoline vapors from sources listed above. Saturated GAC are transported to the coal power plants and burned. This system was developed to eliminate hydrocarbons and chemical/biological agents in contaminated water. This process again utilizes GAC in two reactors by destroying the contaminants in the first reactor using microwave energy, and absorbing any residual contaminants with GAC in a second reactor. The process is then run in reverse to regenerate the GAC in place by switching the microwave energy to the other reactor. 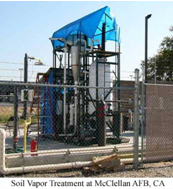 This provides a continuous process with contaminant removal, resulting in pure water. a. Toxic water treatment for industrial water effluent to include refineries and chemical companies. b. Any scrubber water or any water that contains hydrocarbon. c. Destroy chemical/biological warfare agents in water. d. Use as a “safe” drinking device for home or industrial use. e. Very effective with Benzene and other carcinogens. Incineration or UV oxidation (illegal in some areas and expensive where legal). This technology breaks oil/water emulsion using energy waves. The purpose of the process is to remove the water from the oil thus enhancing the commercial value of oil. The process has been successfully used on a variety of different oil and water emulsions ranging up to 40% water. The process is housed in a surface tank and is performed in batch treatments. a. Emulsion breaking at refinery sites and chemical companies. b. Emulsion breaking at water treatment or disposal facilities. Chemical treatment, or heat (both very expensive). ERI has also performed tertiary recovery work in two shallow oil fields.